Who rose to enduring fame on Blood and Typewriters, told the pregnant Portia of the Chambers it would come out in the end, advised Guthrie Featherstone, Q.C. to adopt a more judicial attitude, returned in the tender gloaming of each evening - via Pommeroy's and a glass of Chateau Fleet Street - to She Who Must Be Obeyed? The answer is Horace Rumpole whose legal triumphs, plundering sorties into the 'Oxford Book of English Verse' and less-than-salubrious hat are celebrated here in this first omnibus edition which includes 'Rumpole of the Bailey', 'The Trials of Rumpole' and 'Rumpole's Return'. John Mortimer's hilarious Rumpole, which fans of Sherlock Holmes and P.G. Wodehouse will love, sees the magician of the Old Bailey at his unpredictable and brilliant best. Sir John Mortimer was a barrister, playwright and novelist. His fictional trilogy about the inexorable rise of an ambitious Tory MP in the Thatcher years (Paradise Postponed, Titmuss Regained and The Sound of Trumpets) has recently been republished in Penguin Classics, together with Clinging to the Wreckage and his play A Voyage round My Father. His most famous creation was the barrister Horace Rumpole, who featured in four novels and around eighty short stories. 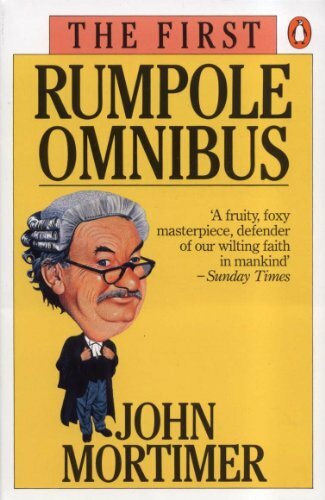 His books in Penguin include: The Anti-social Behaviour of Horace Rumpole; The Collected Stories of Rumpole; The First Rumpole Omnibus; Rumpole and the Angel of Death; Rumpole and the Penge Bungalow Murders; Rumpole and the Primrose Path; Rumpole and the Reign of Terror; Rumpole and the Younger Generation; Rumpole at Christmas; Rumpole Rests His Case; The Second Rumpole Omnibus; Forever Rumpole; In Other Words; Quite Honestly and Summer's Lease.